Back to School S’mores – can the back to school season get any more fantastic?! 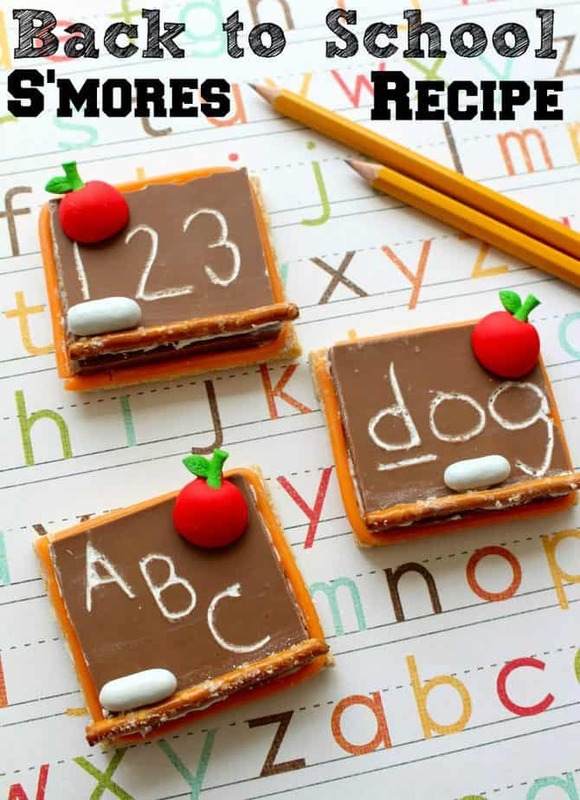 All the fun back to school recipes are just ALL delicious and quite clever! These easy to make treats are not only fun s’mores to make any time during the school year but can make great hands-on classroom activities during parties too! I didn’t snag any in process photos but the step by step directions below will have you making your own set in no time! Check out our recipe and instructions below on how to make your own back to school s’mores! 1. Take a graham cracker square and spread about 1 Tbsp of marshmallow creme on it. 2. Place a piece of chocolate on top covering the entire graham and press down gently to even out the marshmallow. 3. On a microwave-safe plate, place the chocolate and marshmallow graham cracker in the microwave and heat for 10 seconds. Do not overheat or the chocolate will begin to melt and lose shape. Let set to cool for at least 10 minutes. 4. Using a toothpick, carve a Back to School phrase into the chocolate (ABC, Back to School, etc). Be sure to make the ridges fairly deep. 5. Sprinkle powdered sugar all over the top of the chocolate s’mores piece. 6. With a lightly dampened paper towel, wipe the powdered sugar off the top of the chocolate, leaving the sugar in the carved ridges to resemble a word written in chalk. 7. Dip a toothpick into ready to spread frosting and use it to glue a pretzel stick to the bottom of the chocolate s’more, resembling the base of a chalkboard. Set aside and let set for at least 5 minutes. 8. Dip toothpick into ready to spread frosting and spread on back of the Wilton sugar Apple and press onto the chocolate chalkboard. Let set for a minute. 9. Dip toothpick into ready to spread frosting and spread on the back of a white Ike and Mike candy. Press onto the chocolate chalkboard right above the pretzel stick to resemble a piece of chalk. Let set one minute. I am having a hard time finding the apples. I’ve tried Michaels, Hobby Lobby, Wiltons, Amazon, and Etsy. Any other ideas? I loved this idea, but was not happy I could not print or copy and paste. You are not helping live on a teachers salary. I’m sorry that you’re having such a difficult time living on a teacher’s salary – we have plenty of articles that can help you learn how to save money. I recommend that you learn how to print off of websites – Google is a great help! Just go to http://www.google.com and search for what you don’t know how to do! You can even watch a YouTube tutorial if you need a more visual option. You can easily print off of the task bar or by screenshot. Or simply go old fashioned with a pencil and paper purchased at any local retail store! Hey – don’t forget you can just snap a pic on your cell phone too! I made these and they were a big hit, however, I could not make the microwave step work so ultimately didn’t do that step. I also found that within an hour the marshmallow was seeping out over the sides. It was necessary to pipe a line of frosting around the edge of the graham cracker and then spread marshmallow inside that. Also recommend carving phrase in the chocolate before placing on graham cracker.